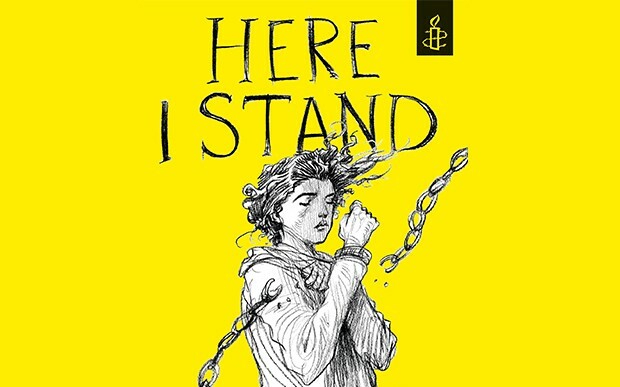 Twenty-five of the world's most celebrated writers and illustrators have come together to create Amnesty International's Here I Stand anthology, an eye-opening collection of stories, poems and drawings on the theme of human rights under threat. Learning about the witch trials at school gave me nightmares, so of course I passed them straight on to Isobel. That’s what big sisters are for. I told her all about the witch hunts in Salem and in Britain – the lies, the crazy accusations and the torture of the so-called “witches”. I made her imagine being trapped in a leg-crushing device and thrown into a pond with her right thumb tied to her left toe so she couldn’t swim. So of course poor ten-year-old Isobel woke up screaming in the middle of the night, saying that the Witchfinder General wanted to burn her. Afterwards, out on the landing, Mum tore a strip off me. I almost told Mum about my nightmares, but she would just have sighed and told me not to be a baby. If I came home with a broken leg, I bet she’d say I was trying to get attention. Scaring Isobel was silly and cruel, I knew that. I was three years older than her – old enough to know better – and I suppose that was why I did it. Isobel was allowed to be a “baby” and somehow I never was. In the worst nightmare I was sort of me, but sort of someone else, and I was on trial as a witch. Everyone was there – Mum, Dad, Isobel and all my friends – and none of them would look at me. That was the worst part. Terrible things were going to happen, and nobody would stop it or speak up for me. Nobody would save me. I could feel the threat of the pins and crushing machines, like teeth that might close on my flesh. But instead the witchfinders took me away to a room and made me walk back and forth, back and forth. It wasn’t too bad at first, but hours went by and I started to get dizzy. And whenever I sat down, or fell down, men came in and hauled me to my feet again and made me keep walking. Then most of a day had gone, followed by most of a night, and my legs were shaking and I wanted to sleep, or cry, or throw up. Then the sun was coming up again and the sight of it through the window made me feel properly sick, and I tried to sleep in tiny bursts, just closing my eyes for an instant, but they wouldn’t let me. The next day was so long, and my eyes felt dry, and then the sun was setting and my legs wouldn’t hold me any more, and my head weighed a ton, but they kept hauling me to my feet, and slapping me awake, and forcing me to walk. And it went on and on, and I cried and cried, and I would have killed for sleep, died for sleep, done anything for sleep, and my brain became a mad fog, and I started to see things: shadows shaped like smiles, and rats in the corner of my eye, and writing on the backs of my hands. Witch, the men said, over and over again. Witch. Witch. Admit that you are a witch. In the last moment of the dream before waking, something cracked in my brain and I began to believe that they were right. Even when I woke up, I felt sick as I lay in my bed. I ought to have felt relieved. I ought to have felt safe. But instead the scenes in the dream ran round and round in my head. I saw myself abandoned, broken. If witchfinders had burst into the house and tried to drag off Isobel, I knew my parents would fight to the death to protect her. But lying there alone in the dark, I didn’t quite believe that they would do the same for me. Instead I saw their faces as they had looked in the dream trial. Closed and cold, refusing to meet my eye. I meant to stop teasing Isobel about witch trials after that. But when she couldn’t find her gym shoes the next morning, I accidentally suggested that maybe the ghost of a dead witch had stolen them. It was a joke, but Isobel went white and scared. I forgot about it straight afterwards, of course. But Isobel didn’t. That evening at dinner, I noticed that she was a bit quiet. But I wasn’t really paying attention, because we had the TV on while we were eating, and the newsreader was talking about torture. That word jolted me straight back to my night fears. It was a piece about a place called Guantanamo, which is sort of a prison where they put terrorists, or people they think are probably terrorists. Some of the prisoners were saying that they had been tortured there to get information out of them. “That’s grim,” I said aloud. I didn’t know what “waterboarding” was, but it made me think of the “witch-ducking” we’d learnt about at school. “We don’t know if it’s true,” said Mum curtly. “I don’t believe American troops would do that sort of thing.” Her brother is a soldier. I couldn’t be so sure. Maybe normal soldiers wouldn’t, but armies and navies are huge. How could you know that nobody in them was torturing anybody, unless you checked? “Dad!” I couldn’t believe my dad was sitting there with a bottle of ketchup in one hand, making excuses for torture. I wanted them to say that they would never let that happen, that I was right – torture was wrong – and that they would fight tooth and nail to protect me. Wouldn’t it? How could she be so sure? If it could be someone, it could be anyone. I glowered at my food while Mum and Dad watched the weather forecast as if our conversation was over and settled. It was then I noticed that Isobel was gobbling her food, and hadn’t said anything all meal. “What’s up with you?” I murmured. I decided to humour her and agreed not to tell our parents, but I had no intention of letting the lunch thief get away with it. Isobel and I are at the same secondary school, in different years. Isobel should still be at primary school, but she was moved up a year. Clever but sensitive, Mum says. We have our own friends, and don’t hang out together much. At breaktime the next day, however, I slipped round the side of the school near the bins. There was a window that would let me spy on Isobel’s classroom. I got pretty bored standing there, with the wasps and the stink from the sun-cooked bins. But then I saw a small, skinny black girl, not much older than my sister, slipping quickly and furtively into the classroom. The slender plaits lining her scalp bristled with stray hairs, and she wore a faded red T-shirt and tracksuit bottoms. She went straight to the nearest desk, and pulled out a Frozen lunchbox. I recognized it at once – it belonged to Isobel. She took out the sandwich, cereal bar and apple, put them in her bag and quickly stuffed the box back in the desk. She looked wary but also oddly matter-of-fact. It took me a while to find a teacher on duty, and when I did it was Mr Wilton. He’s got scuffed trainers and big, dopey, hopeful eyes, like he thinks he’s in a different school, one that doesn’t have barbed wire along the tops of the walls. It’s funny but a bit sad watching him trying to keep order. He’s like a wet paper bag trying to hold a typhoon. When I told him what I’d seen, he looked harassed. He crossed the playground to where the skinny girl was sitting cross-legged on one of the benches, picking at a crack in the sole of her trainer. Mr Wilton squatted beside her and asked her something gently, and without a word she emptied her bag on to the bench. Even at a distance, I could see that I’d been outwitted. Exercise books, a pencil case, some sort of green plastic mascot. No sign of Isobel’s lunch. Like an idiot, Mr Wilton walked straight back to me, making it obvious who the telltale was. The skinny girl met my gaze, but there was no smirk, just a hard, tired wariness, as if she was trying to work out how much of a threat I was. Mr Wilton was off at a run, towards a fight that he had no chance of breaking up. And somehow a girl had just robbed my sister and got away with it. I tracked down Isobel, and told her about the lunch thief. I even gave her one of my sandwiches – but not half my cereal bar. “No, she said she came from the Congo, in Africa. 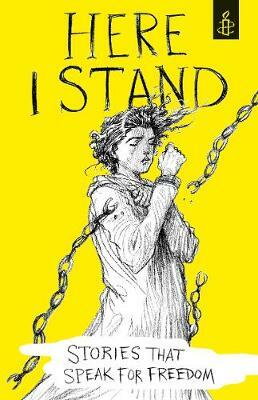 But anyway, she’s gone a bit weird, and now I don’t really talk to her any more.” Isobel shrugged. I was only half-listening. A plan was forming in my head. I would follow Grasnie after school, I decided. When she retrieved Isobel’s lunch from its hiding place, I would take a picture of her doing so on my phone. And then I could go to the teachers with proof. I felt so proud of myself, playing detective. After school I hid in the corridor near Isobel’s classroom. When most of the younger kids had gone, I saw Grasnie slip back, drop to all fours and reach under one of the big cupboards in the classroom. I had my phone ready, but I was too slow to take a photo when she sat up and stuffed Isobel’s lunch back in her bag. I looked for a teacher but couldn’t see one. Instead I followed Grasnie out of the school, keeping my distance. She would have to stop and eat it somewhere on the way home. Her parents would surely be suspicious if she brought back an unfamiliar lunch. Pretending that I was looking at my phone, I dawdled down the road after her, then followed her into the park. She came to a halt in the play area, sat down in a hanging tyre and took Isobel’s lunch out of her bag. Crouched behind a bench, I angled my phone and took a photo of Grasnie as she unwrapped the sandwich, the rest of the stolen lunch in her lap. I could have sneaked away then, but something about the nervous eagerness in Grasnie’s face gave me a queasy, uncomfortable feeling. So instead I stayed where I was. I watched as the skinny girl ate the sandwich with hasty intensity, cupping her hand so no crumbs would fall and finally licking them off the clingfilm. She gobbled the cereal bar the same way, and then ate the whole apple, even the core. Not mean. Not greedy. Starving. Eventually she jumped down from the tyre and carried on walking towards a housing estate on the far side of the park. Her steps slowed and slowed as she approached it, as though she wanted to make the journey last for ever. While Grasnie was hesitating in front of a house, a woman came out, face set and hard. She grabbed Grasnie by the arm without a word and dragged her in through the door. I stood there staring. There was something wrong with what I had just seen. I couldn’t imagine my mother looking at me so coldly, or yanking my arm like that. I crept closer, until I was behind the hedge, not far from an open window. There was a lot of adult yelling going on inside the house in a language I couldn’t understand – a woman, and at least two men. And then a much shriller voice cut through, desperately squeaking the same thing over and over. Even though I didn’t know the words, I could feel in my gut what the girl was shouting. I’m sorry I’m sorry I’m sorry I’m sorry. Then I heard a slap. A loud, hard slap. And then another one. Everything went quiet after that, and I crept back to the park, unsure what to do. After a while, Grasnie came back out of the house and began walking back to her tyre in the play area, still wearing a tired, matter-of-fact look on her face. There were tears on her cheeks she hadn’t bothered to wipe. When she looked up and saw me, she froze. She didn’t believe me, and I saw her getting ready to run. She must have recognized me from the playground. So I went straight to Plan B. I held out my phone. She was still tensed up, but she stayed where she was. “What do you want?” she asked. She did sound a bit French. As I got closer, I realized how small she was – even smaller than Isobel. It took the wind out of my sails, and made my revenge plans seem stupid and petty. “Somebody hit you, didn’t they?” I said, glancing towards the house. She dropped her gaze and shook her head. I could see now that her skin was slightly greyish, and a bit dry and flaky-looking round her mouth. Again I noticed her hair, and all the little plaits which should have been glossy and immaculate but were scruffy and matted as though they had been slept on night after night. Weird, Isobel had said. But the only reason Isobel’s hair was shiny and smooth was because Mum made sure it was washed and brushed. It was then I noticed an angry reddish blotch on Grasnie’s forehead, half hidden by her hairline. “Well, what’s that then?” I demanded, pointing at it. Grasnie flinched. “A kettle?” I supposed that it could be a burn or scald mark, now that I looked at it. There were other marks and scabs on her arms as well. Gross rashes, Isobel had called them. But they could also be grazes or burns. And they couldn’t all be accidents. I held up the phone in front of Grasnie, my hand shaking. I couldn’t think of any other way to make her talk. Whatever was happening to her, somebody needed to report it. When I said the word “police”, she stiffened. Once again she was watching me with that steady, cautious, calculating look, as though I were a firework that might still explode, or a gap she had to jump. “Delete the photo first.” She pointed at the phone. I pressed a couple of buttons on my phone to set up the delete, and hovered my thumb over the confirm button. “You can’t ever tell anyone,” she said at last. Then she started to talk, quietly and haltingly. Before long I wanted to say, Stop, I’ve changed my mind – I don’t want to know any more. It had been happening for months, ever since her mother found a new church in London. It was a very small church, made up of only a few Congolese families, and didn’t have its own building. Most Sundays it met in a room over a phone repair shop. Bible study sessions were held in Grasnie’s mother’s house during the week. At church meetings the pastor hit Grasnie, and poured hot candlewax on her skin. Once he had swung her against the wall, making her knock her head and see stars. Grasnie’s mother always thanked him afterwards, and gave him money for the church. At home Grasnie slept on the floor, in a different room from all her brothers and sisters. Sometimes her mother burnt her with matches, poured stinging liquid in her eyes or splashed boiling water on her skin. Some days her family fed her, some days they didn’t. Grasnie met my gaze with tired eyes. “Because I am a witch,” she said. I felt as if a well of craziness had opened up underneath me. The stories of witch trials had scared me, but witches themselves … for me, those meant Halloween wigs, warty noses, black cats. They were nonsense – they were fancy dress. But here was Grasnie talking about being one with flat, hopeless certainty. For a moment she almost made me believe it. “When we first came here, I walked in my sleep,” she explained. “My mother took me to the pastor, and he said that I had kindoki. They want to get rid of the evil spirit.” She gave a very small shrug. She was not much older then Isobel. Grasnie shook her head hard, and I flinched before her gaze. “Don’t tell anyone,” she said fiercely, “or I’ll say you’re lying.” She reached out before I could react, and jabbed her thumb down on mine, pressing the phone and deleting the photo. The answer hit me before I had finished the sentence. If the truth came out, her torturers might end up in prison, and one of them was her mum. I couldn’t have sent my mum to prison. Not ever. Grasnie’s gaze flicked to one side, and I realized that we were not alone. There was a man watching us. He appeared to have come from the direction of Grasnie’s house. His watch looked expensive, and there was a small Bible tucked in the pocket of his suit. “Grasnie, come away. Don’t bother this nice girl.” He had the same accent as Grasnie. His mouth smiled and his eyes did not. “She’s not bothering me,” I said, voice tiny. He scared me. I nodded, and a moment later wished that I hadn’t. Grasnie got up without a word, head bowed, and headed towards her house. Right then, I was so frightened I thought I would throw up. My head wanted to nod, to agree with him so I would be safe, but I didn’t let it. Instead I turned and hurried away through the park, my legs wobbly. That man was one of the people hurting Grasnie, maybe even the pastor. He knew my face now. If I told anybody about what was happening to Grasnie, he would probably guess it was me. And he knew where I went to school, which meant he would know where to find me. I ran the last part of the way home and went straight to my room. I heard Mum calling me, but I put my music on and pretended not to hear her. At last she came up and knocked on my door. When I opened it, I saw her annoyed expression melt away, and I knew I must be looking white and shaky. She didn’t roll her eyes, or tell me not to be a baby. She led me back to the kitchen and sat me down. I told her all about it. I told her how scared I was. And I sobbed more than Isobel had after her dream. I stared at her. I couldn’t believe what she was saying. I mumbled something, a promise, and went to my room. I had done my bit. Hadn’t I? I had told my mother. But I was starting to realize that adults didn’t always solve things. She would phone the school, she’d said so. But I could almost hear how it would go. I took out my own phone. I knew there was a non-emergency police number that I could use if I wanted to report something. But instead I just sat there, staring at my phone. I tried, I told myself. If I do anything else, I’ll get into trouble. Mum will be angry with me. And if she won’t believe me then the police probably won’t. Besides, Grasnie will deny it all to protect her mum. And that man, he’ll come after me. Maybe he’ll come after all of us. Isobel too. Plus it’s none of my business. She’s not my friend. She’s not even in my year. And maybe she really does make things up. But it wasn’t complicated, not really. I knew that these were just excuses. I wanted to forget that any of this had ever happened. Somehow I had blundered into a terrible world of cruelty and unfairness. I wanted to get out of it, so I could go back to normality and safety. My eyes filled with cowardly tears and my vision blurred. All I could think of was my nightmare about the witch trial, but from a new perspective. The dream had scared me, but now I realized that it had always been a fantasy. Me as the tortured heroine. Me as the innocent victim. Me as the centre of attention. Me, me, me. At last I understood what I really was. I imagined the dream trial again, but this time I wasn’t in the dock. I was just another coward in the silent crowd. Hugging my safety. Letting the torture happen. Looking the other way. "Torture still happens, sometimes in distant lands, sometimes in our own neighbourhood. Faced with something that terrible, it’s easy to feel out of our depth, and as if there’s nothing we can do. There’s always something we can do. If Kay had called the police, they might have listened to her. They have a unit that looks into cases like Grasnie’s, as do charities like AFRUCA. She could have also tried telling her teachers, or phoned the helpline of a charity like the NSPCC. “Even when powerful people or governments commit acts of torture, we can still talk about it, find out about petitions, ask questions or make a fuss. Torture can only happen if the rest of us look the other way and do nothing to stop it."